사마광의 『자치통감』은 정치와 군사의 서술을 위주로 통치자에게 국가의 치란흥망(治亂興亡)의 차감(借鑑)을 제공하는 것이 목적이었던 만큼, 조선에서도 국가의 경영에 절대적으로 필요한 서적이었다. 이 『자치통감』은 세종이 경복궁(景福宮)의 사정전(思政殿)에서 명신·학자(名臣·學者)들의 훈의(訓義)와 교감(校勘)을 거쳐 『자치통감』의 편찬을 완료하고 유의손(柳義孫)·윤회(尹淮)·권도(權蹈)·설순(偰循)·김말(金末) 등의 서문을 붙여 1436년(세종 18)에 초주갑인자(初鑄甲寅字)로 간행하여 경외(京外)에 배포(配布)하였던 판본이다. 경복궁 사정전에서 명신(名臣)과 학자를 동원하여 읽기 편리하도록 주석을 덧붙이거나 빼서 보완하여 편집하였다고 하여 『자치통감사정전훈의(資治通鑑思政殿訓義)』라고도 불린다. 세종조(世宗朝)에 주자소(鑄字所)에서 초주갑인자(初鑄甲寅字)로 간행된 『자치통감』의 판본은 그 전본(傳本)이 매우 희귀한 판본이다. 비록 10권 2책(권131∼135, 246∼250)에 지나지 않는 잔본이기는 하지만 전존본이 희귀하며, 보존상태도 양호하고 표지는 제책 당시의 원형을 유지하고 있다는 점에서 귀중한 가치를 지니고 있다. 『자치통감』은 역사학·정치학·행정학·서지학 등의 연구에 귀중한 자료로 활용될 수 있을 것이며, 특히 조선시대 초기의 금속활자인쇄술 연구에 크게 이바지할 만한 자료이다. Jachi tonggam (Comprehensive Mirror for Aid in Government), or Zizhi tongjian in Chinese, was written by a Song historian named Sima Guang (1019-1086) to provide rulers with examples on the varying fortunes of a state with respect to politics and military matters in particular, and was regarded by the ruling class of the Joseon Dynasty (1392-1910) as an essential reference work for effective rule of their kingdom. 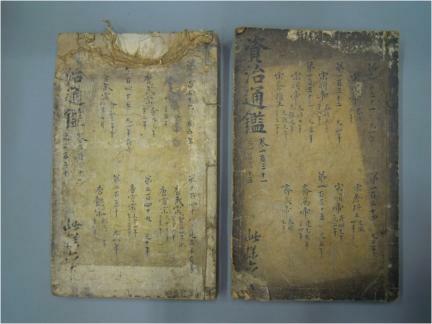 This particular edition of the book was compiled by King Sejong with the assistance of a group of distinguished scholar-statesmen in his government who regularly gathered at Sajeongjeon Hall in Gyeongbokgung Palace to offer him their views and advice. 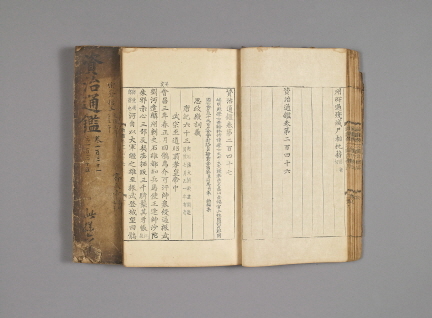 The book was then attached with introductions written by some of these scholars, including Yu Ui-son, Yun Hoe, Gwon Do, Seol Sun, and Kim Mal, printed in 1436 (the 18th year of King Sejong’s reign) using the original Gabin Types, and distributed to government officials serving in and outside the capital. 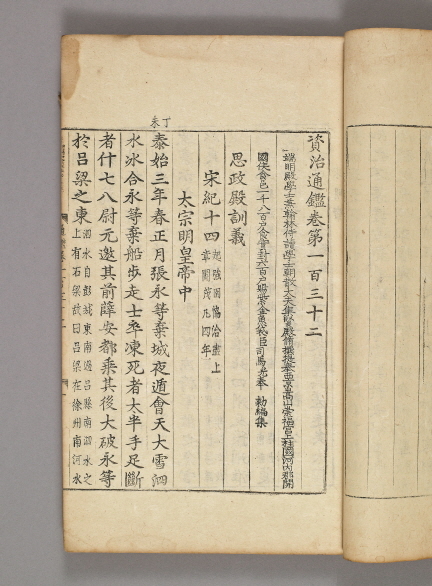 That the successful compilation of the book was greatly indebted to the annotations and editing of the scholars gathered at Sajeongjeon Hall is reflected in the book’s other title, Jachi tonggam Sajeongjeon hunui (Contemporary Interpretation of Zizhi Tongjian at Sajeongjeon Hall). While there are only ten volumes of two books remaining today, the book is regarded as a very valuable asset not only because it is one of those printed at the Type Foundry using the original Gabin Types, which are extremely rare, but also because it has been comparatively well preserved it its original condition. 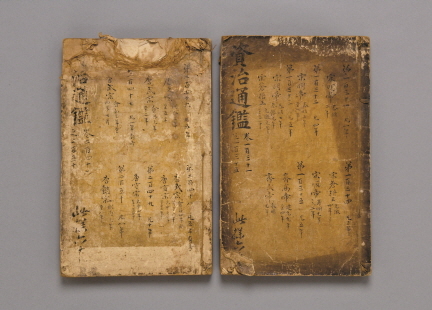 Historians agree that this book constitutes a valuable material for studies of history, politics, administration, bibliography, and, above all, the development of movable metal types during the early Joseon Period.